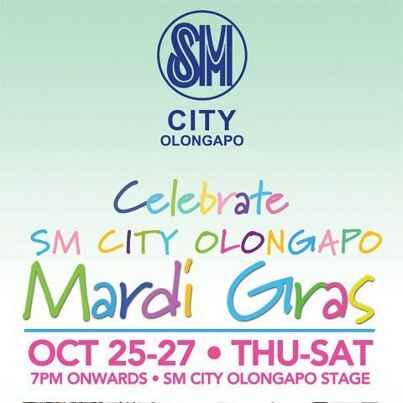 October 27, 2012: It’s been party central in Olongapo for the last three nights. What we first thought was simply a big sale at the SM City Mall actually turned out to be a huge Mardi Gras festival. Think Mardi Gras meets Oktoberfest crossed with Hallowe’en. A national holiday, no less. The organizers went all out. The main street was shut down to all traffic for several blocks and turned into one long pedestrian mall. Colourful streamers promoting San Miguel and assorted mobile companies were strung across the street. Stages featuring live bands and other performers were interspersed with food stalls and tables along the route. Vendors sold everything from snacks to hallowe’en masks and flashy pink bunny ears. All this for just 40P per person (about $1). Add thousands of people into the mix. Mostly young and lots of families with little kids. It seems everybody came out for the party. It was near impossible to make any headway through the crowd, so we picked a table outside the Legion Hall and watched the action going on all around, including the bands that performed on the Casino Filipino stage right next to us. Some with excellent lead singers and some, not so much. For dinner, we picked up some street food. BBQ pork satay, chicken on a stick, fresh roasted peanut and bibingka (sweet rice cakes). All tasty! At 1 am, the bands packed it in, the crowds began to disburse and people started cleaning up. Unlike post-hockey street parties a la Vancouver, there wasn’t a riot or fight in sight. Sadly, we didn’t have the camera with us, so we don’t have any evidence. But it really did happen. Promise! Sweet adventure so far! I am amazed how well you translate the food into English. In fact I didn’t even know that what bibingka was lol. What did we do before Google and Wikipedia?